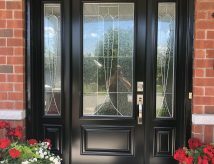 We offer an Extensive Design, Glass, and Colour selection for all of our steel entry doors. From Modern to classic we have a design that will improve the look of your home. Replacing your entry door can improve the perceived value of your home as well as make it more energy efficient. Increased Energy Efficiency and Decreased heating costs.